Lt Peter (Pete) Val Preda was one of the more experienced pilots in the 492nd. He came into the group as part of the cadre source from Langley, Virginia. He also had the benefit of Tactical Training in Orlando, Florida. In order to utilize Val Preda's experience and training, a new crew was built around him using fragments of old and new personnel within the group. Three of the men came from the new Seitzinger Crew (including Seitzinger himself). Two others came from the new Robert Murray Crew and the rest were part of the original cadre source. 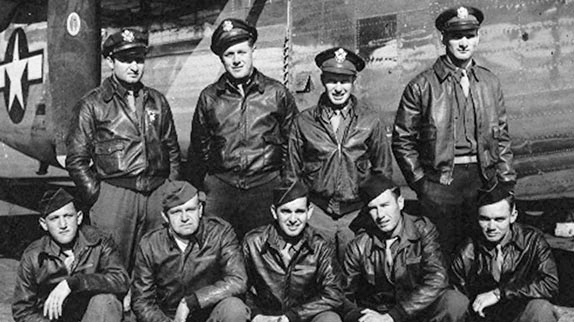 They were assigned as a Lead Crew for the 856th BS and designated as Crew 601. Val Preda signed out for a new B-24J, 44-40163. To our knowledge their plane wasn't given a nickname. In April 1944, they flew their ship to North Pickenham, England, via the southern route. 2nd Lt Charles Lofdahl, the Squadron Bombardier, accompanied them, thus bumping Cpl Miles Toepper onto the Queen Elizabeth. The Crew's photo shown above was taken in the US after Toepper had already left to catch his boat. Lt Val Preda flew as the aircraft commander for Crew 601 for a total of 8 combat missions. Since they were a Lead Crew, they didn't fly combat missions as often as regular crews. Instead, they were given full-time jobs in the squadron's command staff and squeezed in flying missions on a rotating schedule with other Lead Crews. Most of their duties involved training the other crews, especially the incoming replacement crews. It's unclear to us at this time exactly who flew with Val Preda on each of these missions. Lt Seitzinger left him after the crew's third mission having been promoted back to pilot on another crew. On the eighth and final mission the promoted Captain Val Preda had four different officers with him. One was from the Bowland Crew R-11, another from the McKoy Crew R-09 and two from the Hurley Crew 604. It's unclear if these men had been reassigned or were just filling in for the day. Crew 601 was lost on 20 Jun 44 during a bombing raid on the heavily defended oil refineries in Politz. While enroute near Rugen Island, the 492nd's low left squadron was attacked by rocket firing Me-410s and JU-88s. They were among the nine planes hit. Their plane spun out of control. The quick thinking Walton (co-pilot) was able to level the plane by increasing power on one side while reducing power on the other, thus allowing everyone time to bail out into the water. Sgts Pierce and Toepper are believed to have been killed during the battle. Pierce's body was found by the Germans and buried in a local cemetery but unfortunately, the only burial records found after the war did not give the location so he is listed on the Wall of the Missing in Cambridge. Toepper's body was also found and after the war he was returned to his family. Sgts Reed and St Pierre were killed but it's not clear if they had drowned or were killed in the airplane. Their bodies were found by the locals. Reed is buried at the American Cemetery at Ardennes, Belgium, and St Pierre was brought back to the USA. All of the surivors were taken prisoner. Most of them were fished out of the water by German patrol boats. Sgt Kean, also wounded during the battle, was taken to a German hospital where his right leg was amputated below knee. The casualty count for Crew 601 is 4 KIA and 7 POW. MACR 7080.